Furthermore, almost all alcohol abusers started on water and most flooding is directly caused by water. 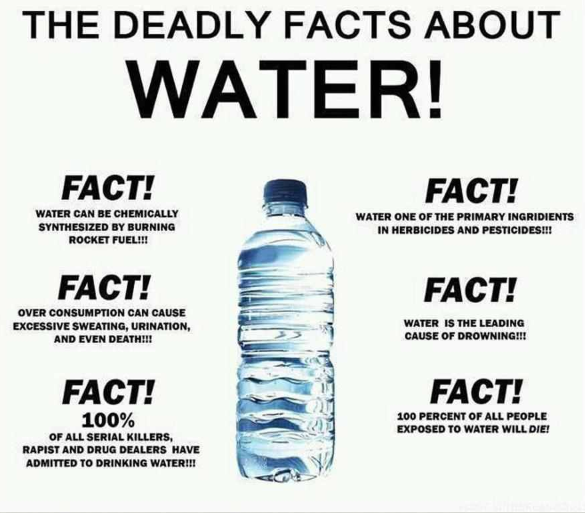 The list of the dangers of water could go on forever. However, on a serious note . . . There are many indirect dangers from drinking water as well. A water bottle accident that is rare but terrifying involves drinking water from popular metal water bottles. This month it was revealed that metal water bottles pose a serious threat to users, not because they emit toxic substances into the water but because the drinker’s tongue can be trapped by the narrow neck of the bottle. NBC’s Rossen Reports revealed that popular metal bottles can grab the drinker’s tongue, which swells rapidly in the neck of the bottle making it impossible to extract the tongue from the bottle. This is especially dangerous for children, and several children whose tongues have been trapped by water bottles have had to undergo dangerous and painful surgical removal. Seeing the NBC video will make your realize that poking your tongue into a metal water bottle may be as dangerous as licking a pump handle in sub-freezing weather. Above: Mary Kate Person got her tongue trapped inside a metal water bottle Extracting her tongue required traumatic surgery and several days in the hospital.